Nashville’s lone run of the game came in the fifth inning. Melvin Mercedes got the frame started with a base hit followed by a bunt single from Kenny Wilson. Two batters later Franklin Barreto drilled a double off the right field wall to score Mercedes. Jensen was dealt his first loss of the season after allowing five runs on seven hits in five innings of work. Chris Bassitt, in his second MLB rehab stint with the Sounds, logged two-plus innings and was tagged for four runs on five hits. He began the eighth inning but allowed three straight hits before being pulled from the game. Joey Wendle extended his hitting streak to eight games with a one-out, bloop single in the seventh inning. The streak matches a season-high for Wendle who hit safely in eight straight from June 8th-16th. The Sounds were unable to cash in with runners on the corners and one out following Wendle’s base hit as Barreto and Renato Nuñez each struck out. Omaha’s Ruben Sosa picked up run scoring doubles against three different Sounds pitchers and drove in four runs on the day. The 15 runs allowed by the Sounds were a season-high for the pitching staff and the nine-run eighth inning was also a season-high. 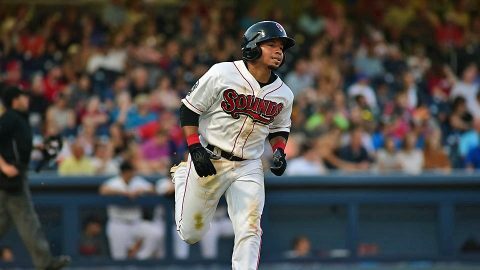 The Sounds begin a four-game series against the Iowa Cubs Monday night at Principal Park in Des Moines, Iowa. Right-hander Corey Walter (2-5, 6.75) starts for Nashville against right-hander Seth Frankoff (1-5, 4.15) for Iowa. First pitch is scheduled for 7:08pm.